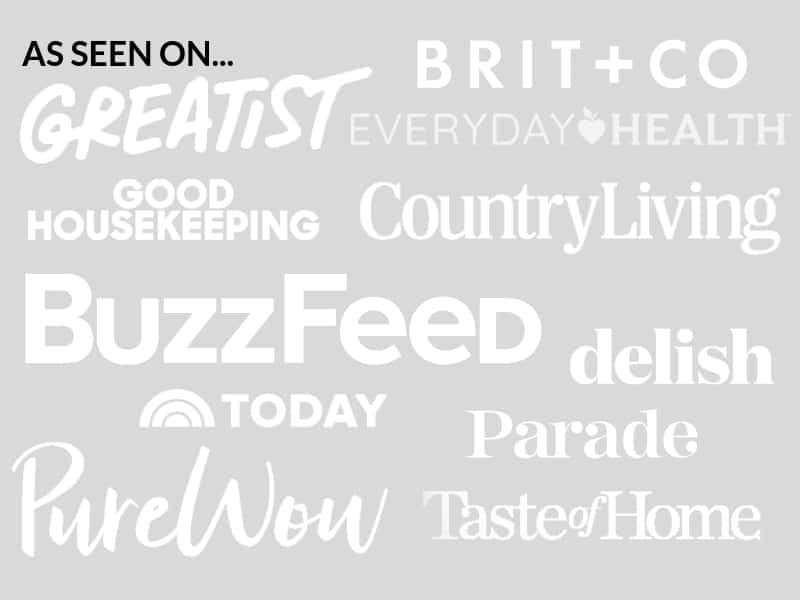 September 21, 2018 By Elizabeth Lindemann Leave a Comment / This post may contain affiliate links. 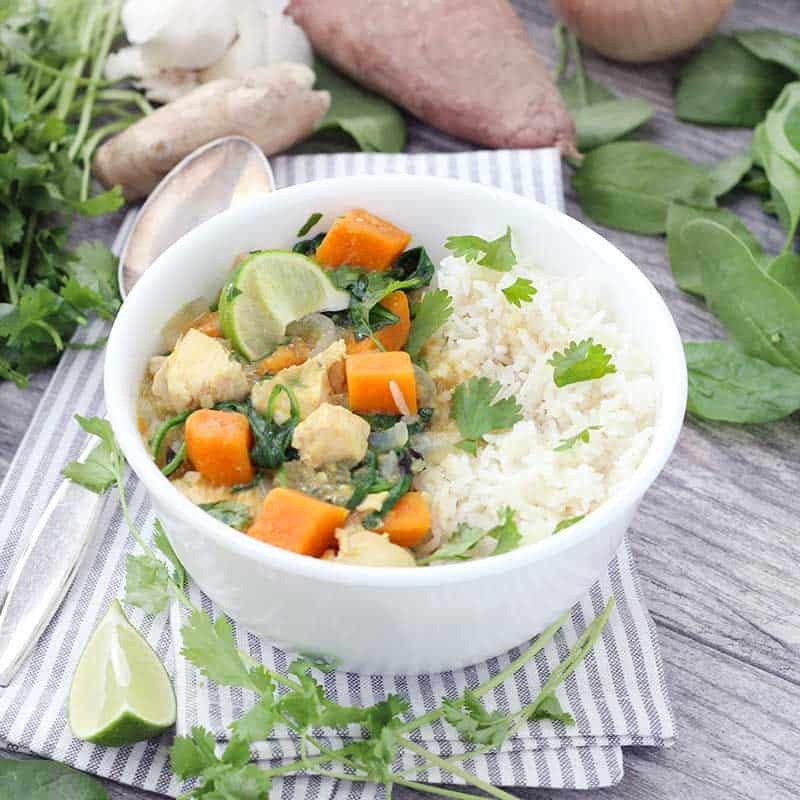 This easy Green Chicken Curry is packed with veggies – sweet potatoes and spinach – and TONS of fresh flavor. It’s mild, slightly sweet, and super nutritious. And it’s dairy free / gluten free / paleo / Whole30 compliant! And it only takes 30 minutes to make! If you know me, you know I love cheese. And all things creamy. Basically, I love dairy. But lately, my 5 month old daughter has been a bit fussy and her digestion has been off. So I’ve eliminated dairy from my diet for a little while to see if that’s the culprit. God help me. I miss it so much. 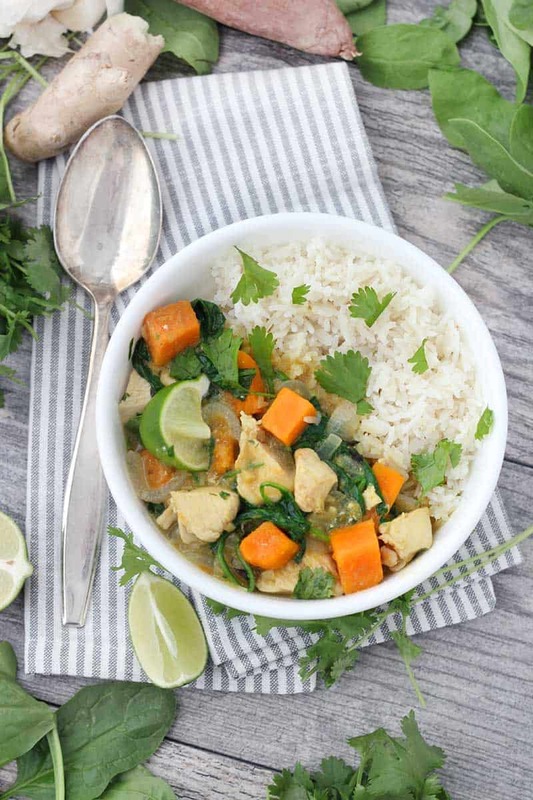 In the meantime, I’m so happy I have recipes like this dairy free green chicken curry. It’s made with coconut milk as a base, which is SO creamy and delicious, and a great way to enjoy that creamy base without any cream or milk. I used a store bought Thai green curry paste to make this. The version I got is very mild- not spicy at all. But it’s still PACKED with flavor from ginger, lemongrass, kaffir lime, and other spices. I’m sure you can find a spicy version if you so desire. Or, add a jalapeño to the mix to spice it up! But as much flavor as the green curry paste has, I had a few tricks up my sleeve to boost the flavor even more. First: fresh ginger. It’s super good for you, and it’s an easy way to add intensely fresh and slightly spicy (but not in a hot jalapeño way) flavor to any dish. Also: honey. 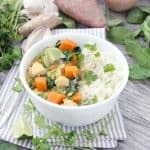 I’m a fan of sweet and spicy, and while this recipe is not spicy in the traditional sense, the sweetness of the honey did help balance out the curry flavors. Plus, it pairs so well with ginger! Finally: fresh herbs- cilantro and basil. I added a bunch of these at the end- a whole 1/4 cup of each, roughly chopped. With delicate herbs like cilantro and basil, you want to wait until you are finished cooking to add them. Otherwise, their flavors will get diluted. I almost forgot: lime juice! I squeezed the juice of a fresh lime into the whole thing at the end to help enhance the flavor of the kaffir lime leaves. It brightened the whole thing up and was so yummy with the fresh cilantro and basil. If you can get Thai basil for this, I definitely recommend it. I used regular ol’ basil (well, I guess the term “regular” is relative- to be more clear, I used Italian sweet basil) since I have a TON of it growing in my garden. Also, my grocery store doesn’t have Thai basil. Here’s a great rundown on what the difference is. In a nutshell: Thai basil has a much more potent flavor and lends itself much better to recipes like this. But Italian basil is better than no basil! I’m always looking for ways to add more vegetables to any recipe, and the addition of sweet potatoes and spinach was soooo yummy. Best of all: my toddler gobbled everything right up! One thing to note: the sweet potatoes take significantly longer to cook than the chicken. That’s why I added them at the beginning of cooking, and the chicken in the middle. I recommend dicing the sweet potatoes rather small, so they cook all the way through without overcooking the chicken. The spinach takes no time to cook at all- I added baby spinach leaves at the very end after the heat had been turned off, along with the fresh herbs. 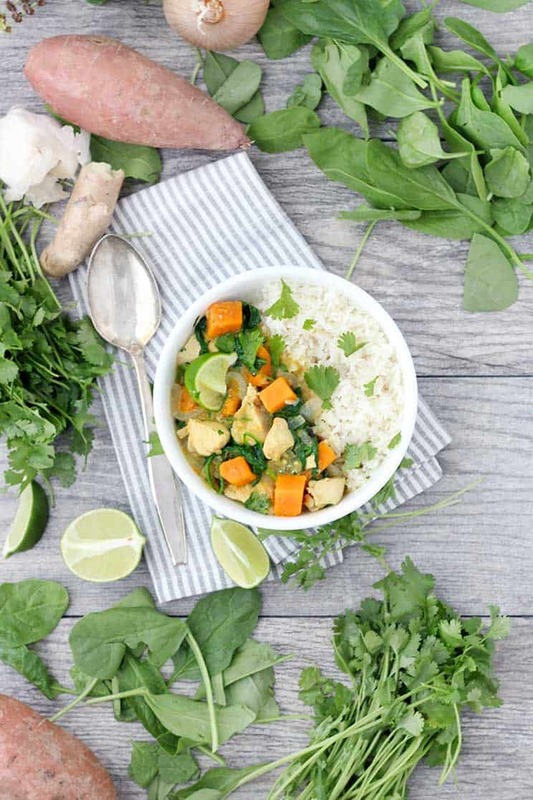 If you like this green chicken curry recipe, you’ll love this Easy Chicken Tikka Masala, this Curried Chicken Salad, and this Moroccan Chickpea and Butternut Squash Stew. One final thing- this is a great recipe to make ahead of time and reheat for lunch or dinner, and it can be frozen in an airtight container for up to 6 months. Eat it on its own, or serve it on cooked basmati or jasmine rice, or cauliflower rice for a grain-free/paleo option. 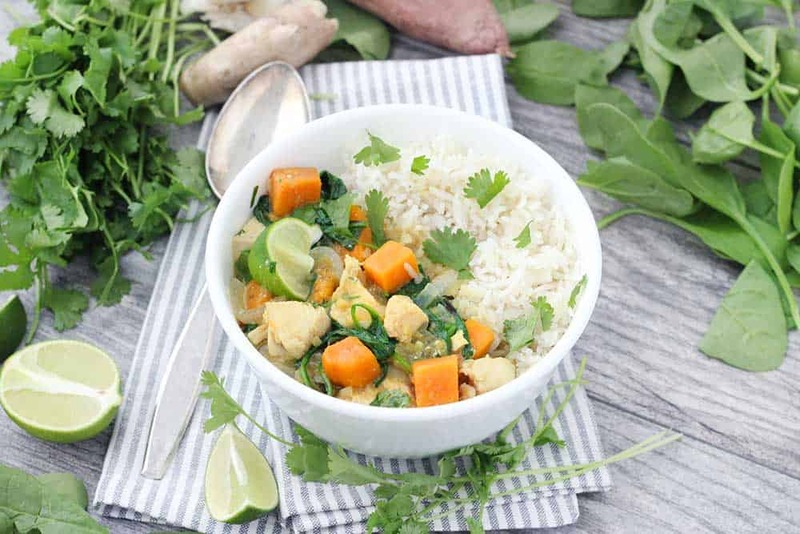 Green Chicken Curry with Sweet Potatoes and Spinach is such an easy, flavor-packed, veggie-packed recipe! This version is dairy free, gluten free, and paleo/whole30 compliant. In a large skillet or pot, heat the canola oil over medium-high heat. Add the onions and sweet potato. Cook until onions have softened and are beginning to brown. Add the garlic and ginger. Stir to combine and sauté for about thirty seconds to a minute, or until garlic becomes fragrant. Shake the can of coconut milk very well before opening it. Pour in the coconut milk, stir, and bring to a simmer. Add the curry paste and honey. Stir until combined. Add the chicken. Cover and simmer on low until chicken is cooked and sweet potatoes are soft, about 15 minutes. Turn off heat. Stir in spinach, cilantro, and basil leaves until wilted. Season to taste with salt, if necessary. Add the lime juice and stir. 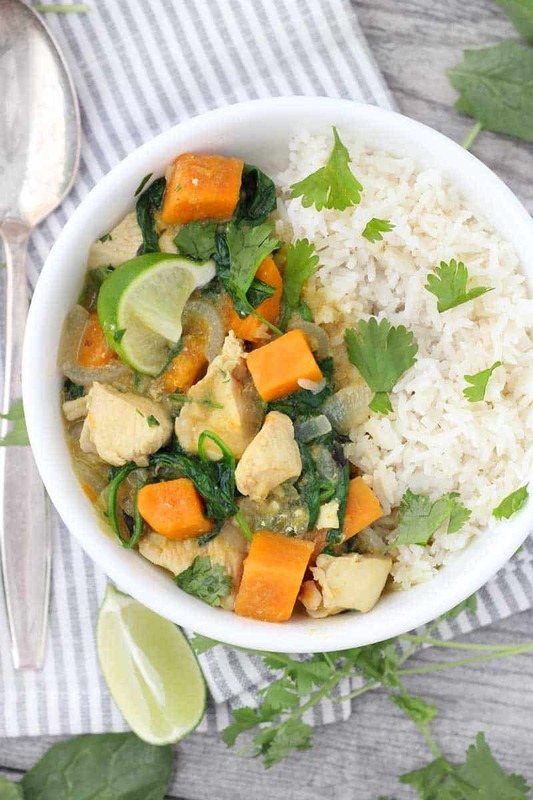 Serve curry over cooked rice garnished with extra cilantro, basil, and lime wedges, if desired. For a whole30 compliant version, omit the honey. For both paleo and whole30 compliant versions, make sure to use coconut oil instead of canola and make sure the coconut milk you choose is meets the standards. Omit the rice or use cauliflower rice instead. 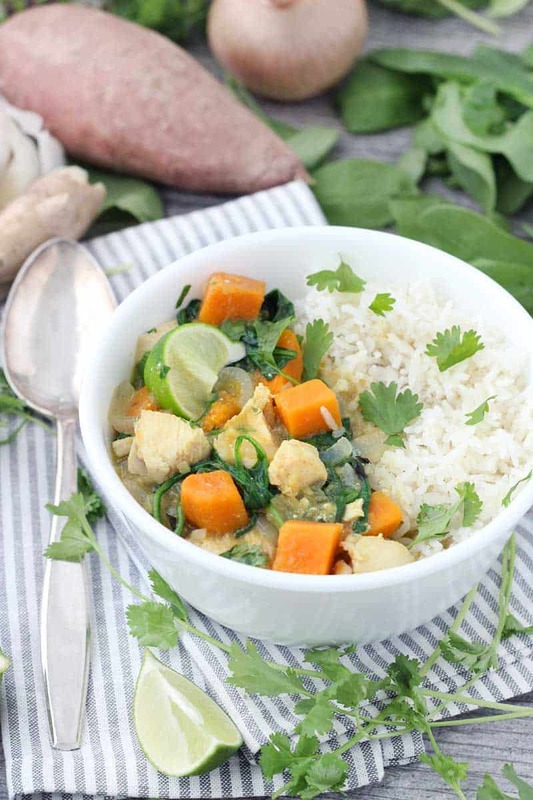 This green chicken curry can be frozen in an airtight container for up to 6 months.